In this day and age when cyber attacks are a prevalent occurrence, as website owners, prioritising our website’s security should no longer be just an afterthought. According to Cybersecurity Ventures, cybercriminal activity will be one of the biggest threats to companies. They predicted that companies can stand to lose at least $6 trillion annually by 2021 due to cyber crimes. Ransomware, DDoS attacks, viruses, online theft and fraud are just a few of the security threats that continues to affect everyone globally and there’s no stopping them anytime soon. So, security experts are strongly encouraging website owners to be proactive with their site security by installing SSL (Secure Socket Layer certificate). In today’s blog post, we will explain in full what SSL is and whether or not you should get a free or paid SSL for your site. SSL is a type of website security protocol that encrypts data as it travels through several networks between the user’s computer and web server. SSL ensures that all data transmitted are kept private and won’t be intercepted by data snoopers. It is typically installed to protect credit or debit card transactions, when logging in to sites, transferring files, accessing sensitive information and many more. An SSL certificate uses a cryptographic key that authenticates and authorizes the real owner of the website. It assures visitors that their connection with an SSL-powered site is protected against third-party intruders. Certificate Authority (CA) is the trusted organization that does the authentication and authorization for SSL certificates. Aside from boosting the security of a website, SSL can bring advantages to your site’s page ranking search engines. Google maintained that security is their top priority and requires website owners to have a strong HTTPS encryption for their site. From October 2017 onwards, Google Chrome (version 62) will trigger a ‘Not Secure’ warning for non-HTTPs websites that have text forms, both on regular and Incognito mode. If you don’t want your site to be tagged as an insecure website, we recommend that you take the necessary step to install SSL for your site. 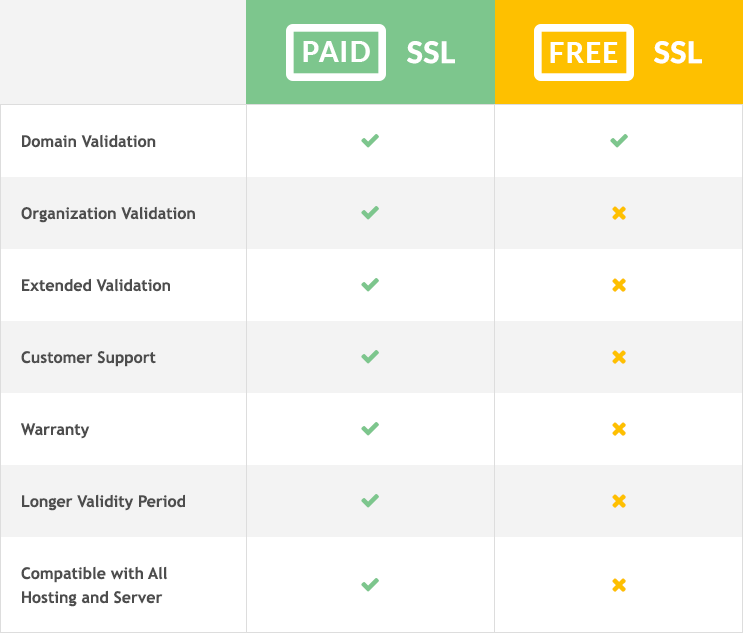 Which One Should I Choose – Free or Paid SSL? Now that the campaign for a strong web security is gaining its momentum, there’s bound to be an increase in SSL options available in the market. Free SSL certificates are offered by vendors to website owners with the goal of making web security more affordable and accessible for everyone. While using free SSLs has its advantages, you need to also weigh other factors beyond its price. Here we have a made comparison points between free and paid SSLs before you start installing one for your site. Free SSLs only offer a basic level of validation for domain ownership. This is great for blogs and small websites that don’t require any logins or forms to access the site. On the other hand, paid SSL verifies and authenticates the site’s business identity before it issues the SSL certificate. It provides options for Organization Validation (OV) and Extended Validation (EV) certificates. Premium SSLs include a “green” secure bar on its address that indicates the level of trust and protection for the site. Paid SSL subscribers are guaranteed of 24/7 customer support as part of their subscription. For any questions about SSL installation, warranties, validity coverage, domain authentication and others, they can simply contact their SSL resellers or Certificate Authority (CA) via phone, email or chat. Whereas, free SSL certificates offer limited to no customer support. Since it doesn’t come with warranties and a service level agreement, you won’t be able to get assistance to resolve any potential issues with your free SSL. It will leave you with no choice but to scroll through old forum posts or search for articles to resolve your problem. Some paid certificates are valid for up to three years. This means that it will only take a day within the year (or years) of the validity period to install the SSL. The rest of the time, you can leave it while it works seamlessly in the background. As for free SSLs, the validity period is often shorter, usually 30-90 days. This can be really inconvenient as you will need to remember to renew the certificate regularly once every few months, or else you will have to reinstall the SSL certificate again. One of the advantages of paid certificates is the fact that you can use it conjunction with almost all types of shared hosting or dedicated servers. Installing your SSL with your shared hosting service is quick and simple as most of the hosting providers offer free SSL installation service with their hosting plan. The same may not be true for free SSLs because the latter may not have the compatibility with any shared hosting plans. To be able to install the SSL certificate, you need to have a root access to the server. It’s a must to have an advanced knowledge and experience when installing free SSL as doing so may accidentally overwrite the server configuration that may lead to severe performance issues. Free SSLs do not offer warranties, so when problems occur, end users can’t expect monetary compensation for any losses or damage from using the product. As for paid SSL certificates, it provides warranty limits and insurance. Under this warranty, website users are covered against loss of money when processing payment at an SSL-powered website with up to $1,000 warranty. Essentially, it’s a warranty for the website user, not to the website owner. If in case that the website owner was uncovered as a fraud, the website user will be compensated for their loss if it was verified that CA failed to validate them accordingly. The warranty offers a safety net to customers when they use an SSL-secured website. There’s no doubt that SSL certificates is a great tool to ensure that users’ data and privacy are protected at all cost. Choosing between free or paid SSL certificates would depend on how you want to use it for your website. Free SSLs are recommended for those with personal blogs or small sites that don’t save any personal data or handle business transactions. However, ecommerce sites or any huge websites that collect customer data should allocate a budget for paid certificates such as OV or EV SSLs. Beyond the security it offers, the most crucial factors SSLs offer is trust and credibility, which do not come cheap at all. If you’re ready to secure your website with an SSL certificate, Singapore host offers the right choice that’s compatible with your hosting plan. Click on the link below to talk with our customer specialist on how to get started. Singaporehost is Singapore’s bespoke web hosting specialist that offers enterprise-grade web htosting for personal and business needs. Each hosting plan is equipped with unmetered bandwidth, supercharged speed, spam controls and 99.9% uptime performance. For more information, contact our 24/7 web hosting specialists today!